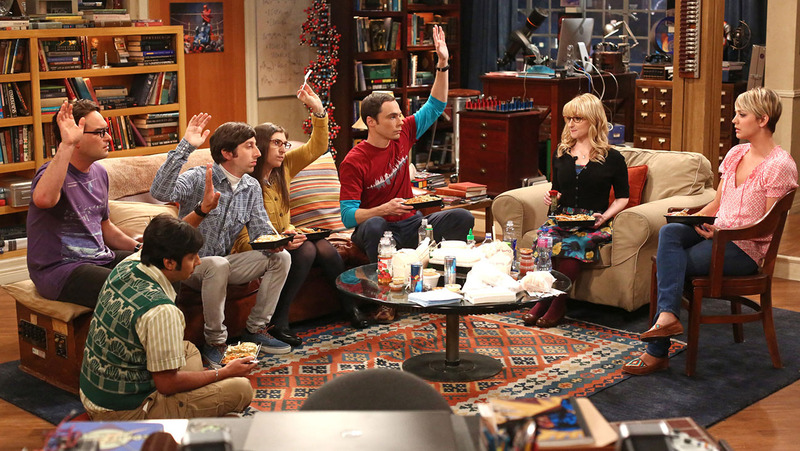 The Big Bang Theory is one of the most popular shows on TV. And with over 200 episodes in the bank, it’s still going pretttty strong. 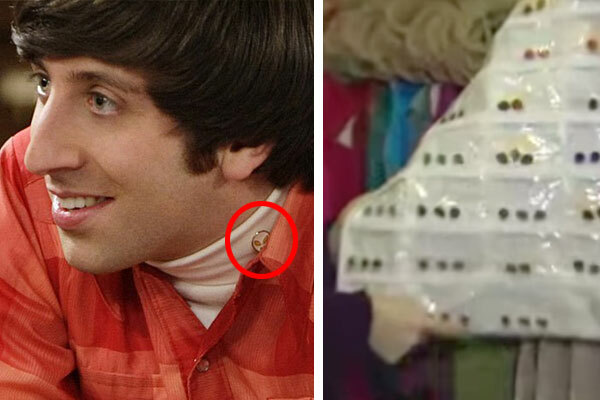 Aside from the adorkably lovable cast, there have also been some pretty cool details over the years, too – like, Penny’s endlessly reoccurring bag. 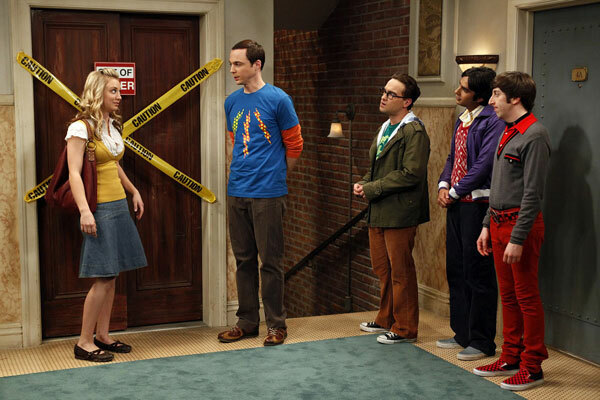 Here are a few other facts that you may not have known about The Big Bang Theory, and you just might feel a TOUCH smarter after reading these. Though maybe not ~Sheldon~ smart, but we can dream…right? 1. 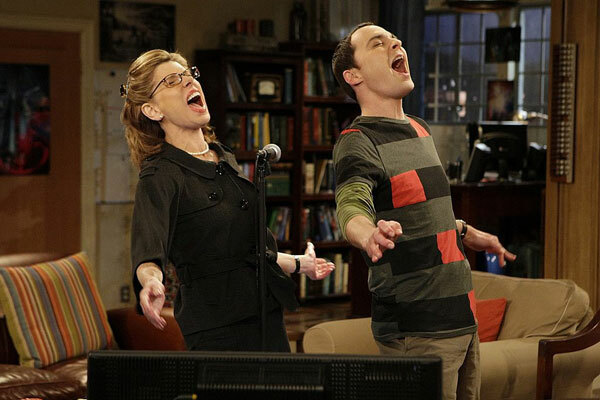 The idea for The Big Bang Theory came from co-creator/executive producer Bill Prady’s experiences as a computer programmer in New York during the ‘80s. According to co-creator/executive producer Chuck Lorre, “The guys he was hanging out with and working with were all brilliant guys, but entirely incompetent in all other aspects of life.” One guy really had a pathological inability to speak to women. 2. The pilot was actually shot twice, which is pretty unusual for any TV show. 3. And Kaley Cuoco auditioned for the role of Penny twice, too, but didn’t get the part either time! 4. Jim Parsons (Sheldon), however, pretty much NAILED it in his first audition and took the producers totally by surprise. 5. The continuously broken elevator was production designer, John Shaffner’s idea. The producers were initially confused when Shaffner presented the elevator facade as a way to fill the space between the apartments. The producers had wanted the characters to be WALKING and talking (not riding an elevator) all the time. But Shaffner explained that the on-going JOKE would be that the elevator was always broken. Huzzah! 6. Here’s where the stairs in the apartment building ACTUALLY go. 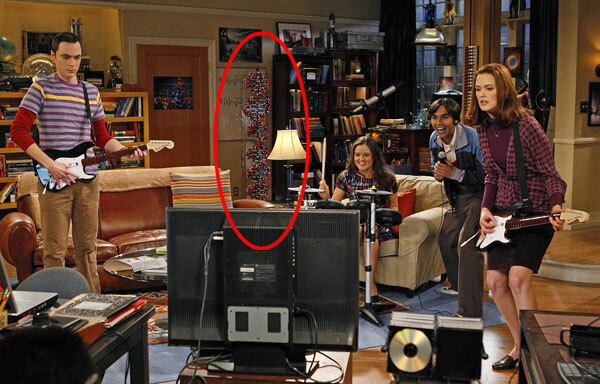 Illusion breaking ~spoiler~ provided by Simon and Kunal (Howard and Raj, respectively) during this set tour. 7. 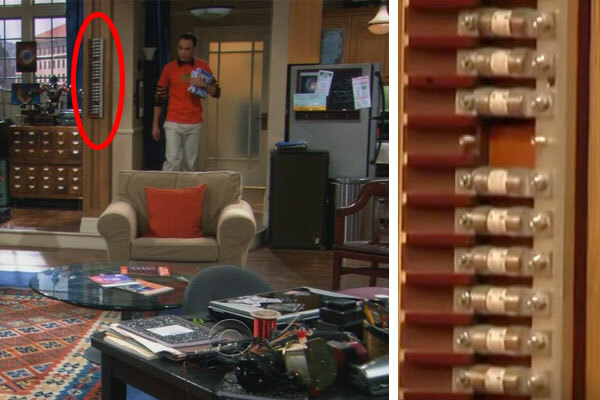 According to set decorator Ann Shea this random bit of set design in Sheldon’s (and formerly, Leonard’s) apartment is just a vintage fuse strip. 8. The famous DNA structure was actually constructed from two displays that were fused together. Shea figured she wouldn’t be able to get a giant DNA model anywhere, so she bought two smaller ones and had the production’s metal shop make an armature to hold it up. 9. 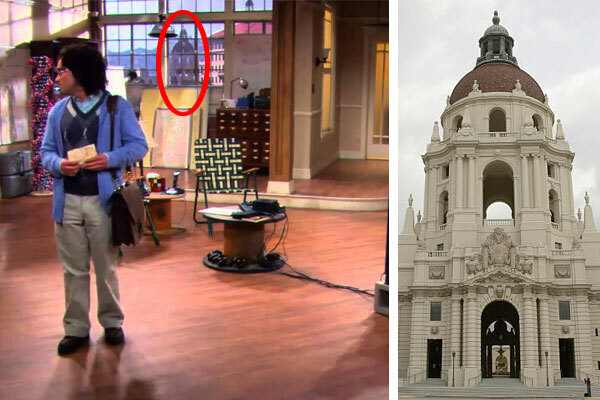 You can actually see Pasadena’s City Hall through Sheldon’s window, which is where the show takes place. 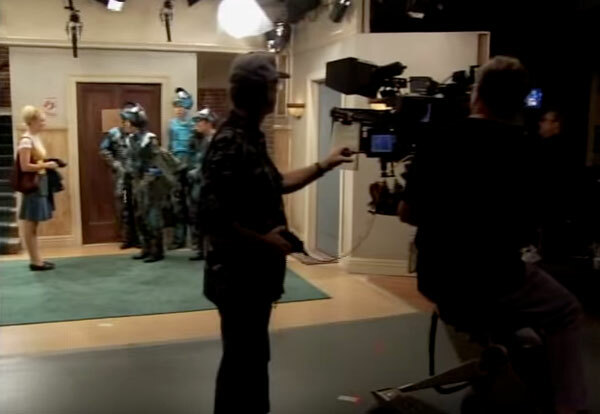 The view was photographed for this background piece both at day and night specifically for the show by the production team. 11. …there’s even a special case for Howard’s alien pins – an ongoing gag/secret between Simon and costume designer, Mary Quigley. It’s apparently significant, but both Quigley and Simon say they’ll never tell. 12. There’s actually been a lot of pressure from fans to have Sheldon and Amy get married. 13. Penny is the only character on the show whose last name we don’t officially know. Although she married Leonard in Season 9, so now she can go by Hofstadter, it’s something of a long-running joke among the show creators that we don’t know Penny’s (maiden) name. 14. And finally, believe it or not, none of the guys in the main cast are into science or ~geeky~ things like Star Trek in real life. 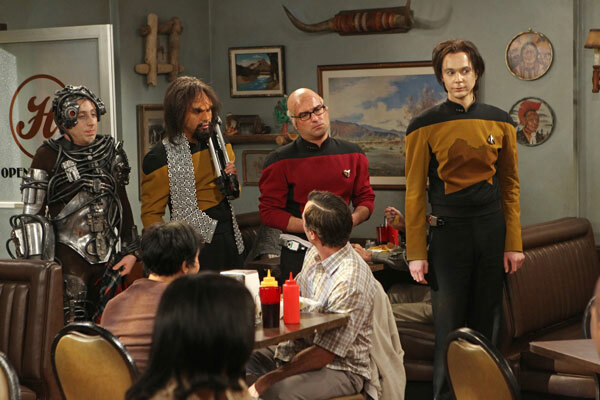 In fact, Jim Parsons claims that he has actually never even seen Star Trek.